It’s that time of the year again. Time for all the kids to end their summer and go back to school. For special needs parents, this can mean so many different things, because we have a child with needs that may be more difficult to handle in a school setting. 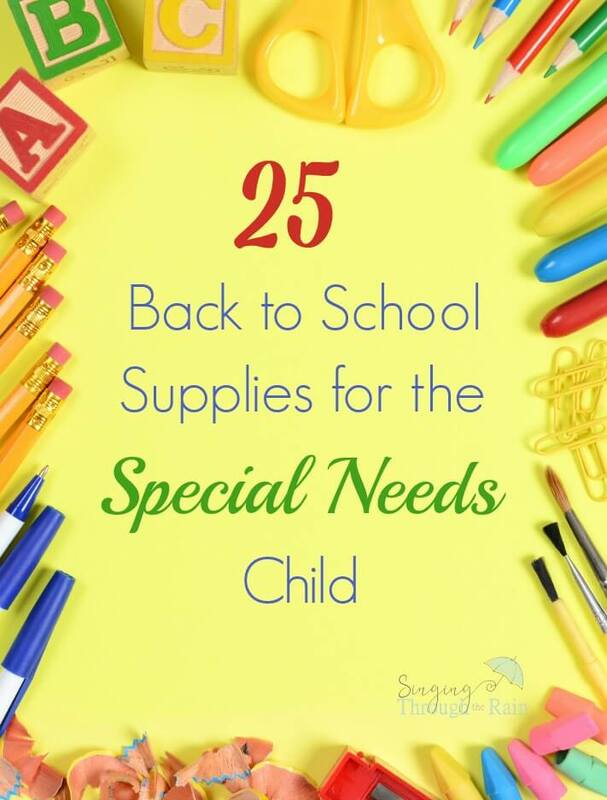 While every school will be different, here are some supplies and tools for the special needs child to help make that back to school transition a little easier! These easy to hold scissors are perfect for the special needs child who struggles with cutting paper or who has a weak grip. A weighted lap pad or vest can help the special needs child sit still in class and help to provide calming and sensory input. The lap pad is great if your child does not want to wear a weighted vest. Chew necklaces are perfect for the school-aged child so that they can have that calming, sensory input all day long and not have to worry about losing the chewy. The chewy pencil toppers are a great alternative for the special needs child who wants to chew on their pencil. Many children with special needs are highly sensitive to bright lights – especially the fluorescent lights that most schools have in classrooms. Sending your child to school with these light filters can help with that so that your child can focus better during classroom time. These bouncy chair bands are great for the child who needs to move while they work. They are easy to install, safe, and quiet so it won’t disturb other students. They are also great for preventing children from tipping back in their seat. Both of these are perfect for your child’s classroom seat. They help with posture, balance, and low muscle tone. Great for kids who need to move a lot. These pencil grips are perfect to help your special needs child hold a pencil correctly and to be able to write better letters and words. Fidget toys are perfect for the child who has a hard time sitting or standing with idle hands. They are fun and are small enough to fit in your child’s backpack. A lot of children with special needs do well with timers. A timer is set and the child can see how much time is left to complete their task. My son uses timers for almost everything and it has helped a lot! For the special needs child who needs a little help transitioning back to school, there are plenty of books out there to help every child of any age. I found this backpack online and I have never seen anything like it! It has huggable straps, a security strap, a personal ID pocket, a hip belt, sensory tool hooks, and a tablet compartment. Want to learn more? Check out this article: Nesel Pack Backpack is Designed to Bring Comfort to Children With Autism. If your child gets overwhelmed easily or can’t stand loud noises, these headphones will help with that! Whether they’re used to help calm, or to help turn down the noise on the playground, they are the perfect back to school tool! While this isn’t technically a school supply item, it is perfect to help work with your child who may struggle with writing during the school year. While I do not know much about this product, I do see that it is used in many schools to help children with special needs stay on task. This special pen will help with grip and can also be used as a sensory tool. For kids who need that input in their hands, this pen vibrates to help give your child a sensory break during the school day. The twist and write pencil is an ergonomically correct pencil. It helps assist kids in writing properly by using the right tripod finger posture and teaches kids the correct way to write. For children who tend to press down too hard when writing, these dry erase markers are strong enough that the tips won’t get pushed in. Each cap has an eraser, making it easy for kids to write and erase at the same time. For the special needs child with shaky handwriting or excessive finger fidgeting, these weights help provide proprioceptive input that will help relax your child’s fingers and improve their handwriting. Will your child be bringing their tablet to school? This case will protect it from any bumps or impacts made by your child. Also, can be used as a stand for classroom use! Does your child require special clothes for sensory problems? Fun and Function has many different things that your child can wear to school, whether it be underneath their regular clothes or on top of their regular clothing, there is something there for everyone! The boundary chair is perfect for kids who have the wiggles and are always falling off their chair. It helps create awareness of your child’s own (and other’s) space and is lightweight for travel between home and school. Also great for home use during homework time. Perfect for the child who is a picky eater or who has oral and sensory aversions, the LunchBlox will keep your child’s packed lunch fresh, separate, and organized so their food doesn’t touch. Don’t miss out on these amazing back to school supplies and tools for special needs kids! What about YOU? What school supplies and tools does your special needs child use?